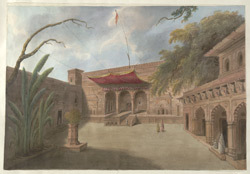 Watercolour of a temple at Brindaban from 'Views by Seeta Ram from Tughlikabad to Secundra Vol. VIII' produced for Lord Moira, afterwards the Marquess of Hastings, by Sita Ram between 1814-15. Marquess of Hastings, the Governor-General of Bengal and the Commander-in-Chief (r.1813-23), was accompanied by artist Sita Ram (flourished c.1810-22) to illustrate his journey from Calcutta to Delhi between 1814-15. Idealised view of a courtyard of a temple at Brindaban, possibly the Gopinath temple. Brindaban (Vrindavan) on the banks of the river Yamuna in Uttar Pradesh. Vrindavan is closely linked to the legend of Krishna and a pilgrimage site for Hindus, like Mathura located a few kilometres away. It was in the forests of Vrindavan that the youthful cowherd Krishna sported with milkmaids. It has several bathing ghats (stepped embankments) leading down to the river and overlooked by temples.